Corporate Landscape: Newtown Mount Kennedy, Co. Wicklow. 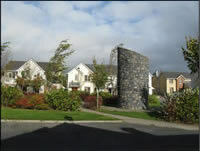 Residential Landscape: Cahir, Co. Tipperary for a private home. 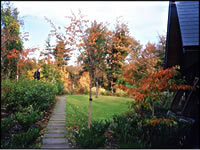 Landscape design included driveway, parking, terrace and path layouts. Outdoor architectural features were designed such as a pergola, water feature, steps and terraces. 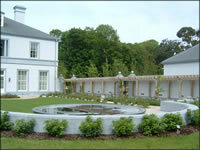 Formal planting layout with beech hedge and lawn, a rose garden, a Mediterranean and temperate woodland planting themes. Emphasis on use of both evergreen and deciduous plants appropriate to the site conditions and to create a seasonal contrast with low maintenance. Corporate Landscape: Slievekeale Road, Waterford. 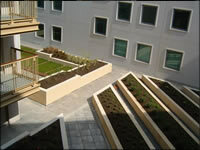 Landscape design included parking, footpath and planting bed layout. Former site of a convent, the architecture firm was appointed to restore the structure and convert it into a clinic facility. An inner courtyard with a formal landscape, a water-feature, benches and gravel paths provided a retreat, or “Healing Garden”. The planting theme consisted of flowering shrubs, perennials and ornamental grasses. A planting theme of informal trees and shrubs around the parking area functioned to enhance visually the space and screen the impact of cars. Corporate Landscape: Canada Street, Waterford. A roof landscape over parking garage accessible to employees and residents. Special needs access was also considered. The roof landscape consisted of a formal contemporary layout of raised beds to facilitate maintenance and appropriate soil depths for plants. Planting beds included a drip irrigation system. Planting themes included shade tolerant plants for woodland of ornamental maples, rhododendron shrubs, evergreen perennials and bamboos landscape with ornamental grasses. Seating and art features as focal elements were proposed to further enhance the spatial experience. Commercial Landscape: Cork Road, Waterford. Residential Landscape: Dunmore Road, Waterford. 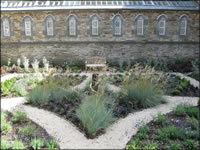 The landscape design included a planting layout. 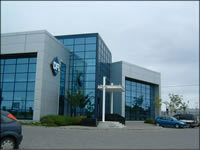 Design requirement was to create a buffer landscape and amenity landscape areas. Planting theme was informal with a woodland theme. Emphasis was on seasonal contrast using a mix of evergreen and deciduous plants.